We love Slime & make over parties and they are by far our most popular option, Glitter tattoos, Glitter space buns and face paint plus making slime its every little girls dream party, lots of glitter and giggles, thechildren leave with big smiles and the slime we have made. Unicorn makeover parties are jelly beads favourite party. lots of glitter and more glitter, glitter hair, glitter tattoos, glitter make over and glitter nails followed by making a beautiful, sparkly bubble gum scented slime, every little girls dream party. add a simple cake and party bag package to your party for £2 extra per child, or add our deluxe party bag package for £3.50. 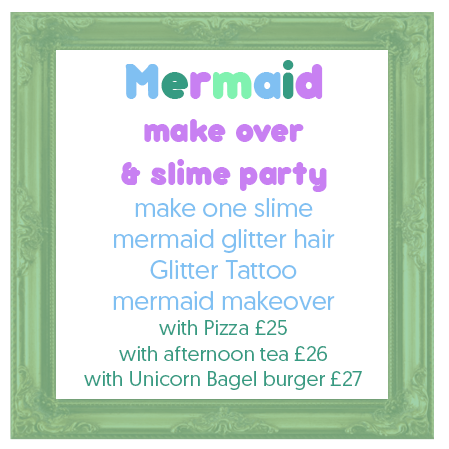 Mermaid makeover parties are fabulous, pretty and enchanted. lots of glitter and more glitter, Mermaid glitter hair, glitter tattoos, glitter make over and glitter nails followed by making a beautiful, marine, sparkly scented slime, every little girls dream party. 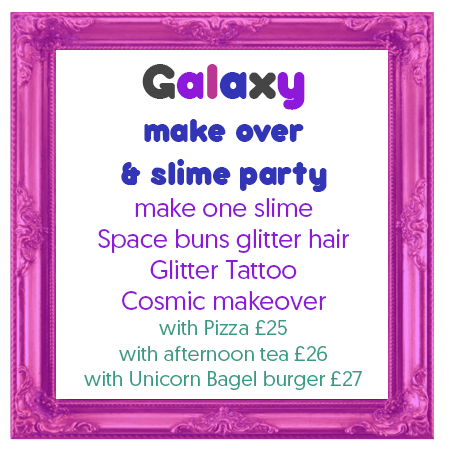 Galaxy makeover parties are amazing, pretty and cosmic. lots of glitter and more glitter, space buns, with star and glitter parting for the hair, glitter tattoos, glitter make over and glitter nails followed by making a beautiful, cosmic, sparkly scented slime, every little girls dream party.